His Highness Sheikh Ahmed bin Saeed Al Maktoum, chairman of Dubai Silicon Oasis Authority (DSOA), opened the Dubai Smart City Accelerator, on May 31. 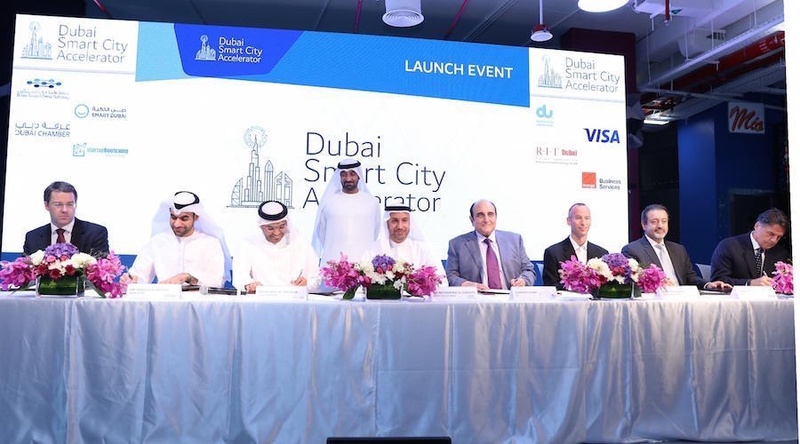 The accelerator has been launched in collaboration with six partners: Emirates Integrated Telecommunications Company PJSC (du), Smart Dubai Office (SDO), Dubai Chamber of Commerce and Industry (Dubai Chamber), Rochester Institute of Technology New York, Orange Business Services, and Visa. Combined they will be injecting a total investment of 18.4 million Emirati dirhams (US$4.9 million) into setting up the program, which is to be operated by Startupbootcamp, a global network of industry focused startup accelerators. Based on smart city technology the accelerator program is targeting startups that are developing innovative solutions that help make cities smarter and that address key challenges such as congestion, waste and energy. The startups in the program will aim to identify solutions within smart homes and buildings, smart transportation and logistics, smart living, as well as smart urban planning and maintenance; to do so they are anticipated to leverage the know-how spheres within the internet of things, sensor technology, big data, and virtual reality. The program has been designed to provide a much sought after testing ground in Dubai for several smart city solutions, applications and products. Today, the UAE is the region’s tech startup hub, hosting almost a third of all MENA investors. Dr Mohammed Alzarooni, one of the investing partners, at the launch of the accelerator program said: “Public-private partnerships play a strong role in the country’s development and translate a positive impact on its economic landscape.” He believes that by investing in startups with high potential and innovative ideas, businesses’ adoption of smart solutions will be facilitated ultimately enhancing the competitiveness of Dubai’s private sector. The program is to run over a period of three years with a total of 40 startups. Those accepted into the program will receive $20,000 in cash, office space in the Dubai Technology Entrepreneur Sector, consultation and advisory support as well as access to Startupbootcamp and its partner organizations - all for 6 percent equity stake in the venture. Registrations for the Dubai Smart City Accelerator are currently open and will close on September 15.